ABOVE: From page four in the full appeal decision. HARRISBURG, PA – In 2006, Michael Piatetsky, a 41-year-old who did not smoke and had no family history of cancer, died from colon cancer. He was employed by Garrison Architects for around twenty years. It was the only place he ever worked. In a 2014 decision by a three-judge Workers Compensation panel in Pennsylvania, Garrison was found liable for exposing Piatetsky to asbestos on a “regular and ongoing“ basis, without providing even minimal protection, such as a face mask. According to unsubstantiated reports, millions in compensation were awarded to the Piatetsky family. The claim was filed in 2009 by the wife of the deceased. According to testimony, Piatetsky worked for Garrison “primarily on commercial projects involving the renovation of municipal and school buildings.” He would come home sometimes covered in dust. According to his wife, he would remove his clothes and wash them immediately upon entering the home, ensuring that they were the only items in the washer. Robert Garrison, son of the founder of Garrison Architects, “guarantee[d]” the court that Piatetsky had not been exposed to asbestos. He emphasized that, according to company policy, “whenever asbestos was discovered or suspected to be present at the job site, construction would shut down immediately until specialists conducted remediation.” He also stated that no employees are permitted on the job site during this time, further minimizing exposure. 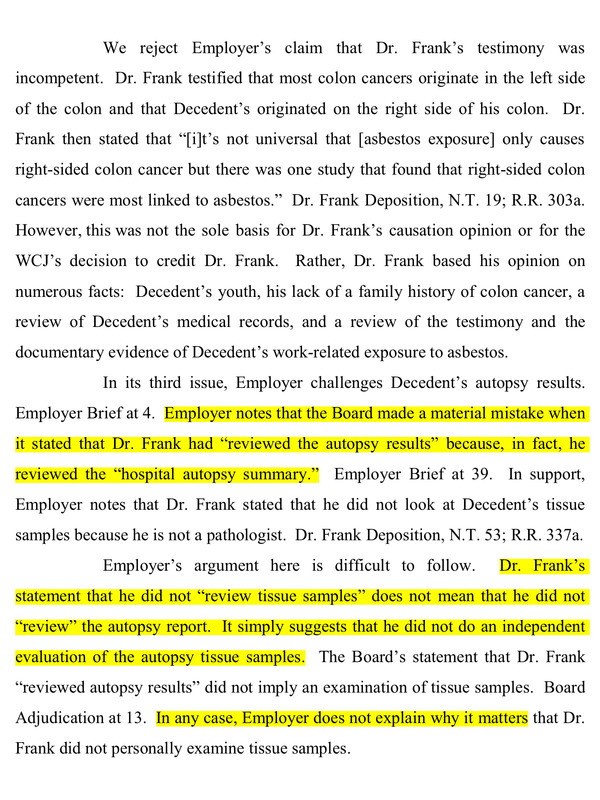 Garrison also testified to the exact opposite: that “from time to time” and on “rare occasions,” Piatetsky was indeed exposed to asbestos. In addition, he confirmed, as written in a 2001 inspection report authored by Piatetsky, that asbestos was found, at least in this particular case. He was then asked by the prosecutor whether this 2001 document was indicative of “many, many others” like it. Garrison responded, “Yes.“ In other words, within all of the records and inspection reports currently stored by the company since the year 2000, “many, many” of them confirmed the presence of asbestos. In fact, the very existence of the company’s remediation policy makes it clear that finding asbestos was at least a somewhat common occurrence. In April of 2014, the court decided in favor of the Piatetsky family. In October 2015, the company appealed the decision. At no point – neither during the original trial nor the appeal – did a medical expert (or any witness) take the stand in support Garrison Architects. In January 2013, during the original trial, a medical expert spoke on behalf of Piatetsky. Garrison Architects was given ninety days in which to produce a medical expert to testify on their own behalf. Garrison requested repeated delays over the course of a year. In January 2014, the court finally put its foot down and forbade the company from providing any medical expert at all. Complicating matters, in December of 2013, one of the three judges on the panel passed away. Two days after his death, Garrison once again asked for an extension. The judge that replaced him, Karen Wertheimer, wrote the (original) opinion. In that decision, Wertheimer berated Garrison for attempting “to take advantage of the passing of a Judge by hoping a substitute Judge would be unable to understand what had taken place before.” Garrison’s attempt to appeal the court’s decision disallowing the company from obtaining a medical expert was also rebuffed. All elements of Garrison’s appeal were denied. Garrison Architects is currently involved in another public school construction project, this time at the high school in Pinelands Regional School District in Little Egg Harbor, New Jersey. The project has been plagued by poor management, oversight, and communication, resulting in numerous health hazards to students, staff, construction workers, and even daycare children. Despite the urging of their own environmental consultants, the district left students in school for three weeks as construction resumed. Why this happened is the biggest mystery surrounding the project. On October 30th, the daycare playground, located immediately next to the high school building, was found to have asbestos. The Superintendent acknowledged that children played in the contamination for a minimum of two days. On August 22nd, 2017, only weeks before the beginning of the school year, asbestos was found inside classrooms, yet no licensed or certified remediation firm was hired, as is required by state and federal law. (This August 22nd information was not reported until September 5th, one day after teachers arrived and two days before students.) On November 27th – just yesterday, as of this writing – two areas on the immediate perimeter of the high school building were found to have asbestos-containing material. Finally, Citizens’ Media TV has confirmed that no advance plan of how asbestos would be removed or transported from the roof was ever submitted to the state Department of Environmental Protection, as is required by the contract (this will be detailed in an upcoming article). Garrison Architects wrote the entire 450-page contract in representation of the district. Many of the stipulations in the contract, in addition to state and federal law, seems to have been violated by numerous parties. Finally, according to Dane Apgar, a high school parent and someone with decades of experience in construction management, Garrison Architects only recently removed the once-proud and prominent mention of the $53 million Pinelands Regional High School project from their corporate website. Despite idealistic company policies and verbal guarantees, a court of law determined that Garrison Architects’ negligence killed one of its longtime employees. Garrison is not the only company involved in this current project. They are, however, along with district administration, one of the few companies responsible for the health and well-being of more than a thousand students, staff, daycare children, children from around the county (who used high school grounds for sports), property owners on neighboring streets (that have reported dust and debris on their property), and construction workers.